My boys are so into superheroes right now. At Christmas, all their new superhero toys lit up the room with a red and blue glow. I can’t complain, it makes them happy. So… this mommy thought I’d throw in some learning fun into the superhero mix! 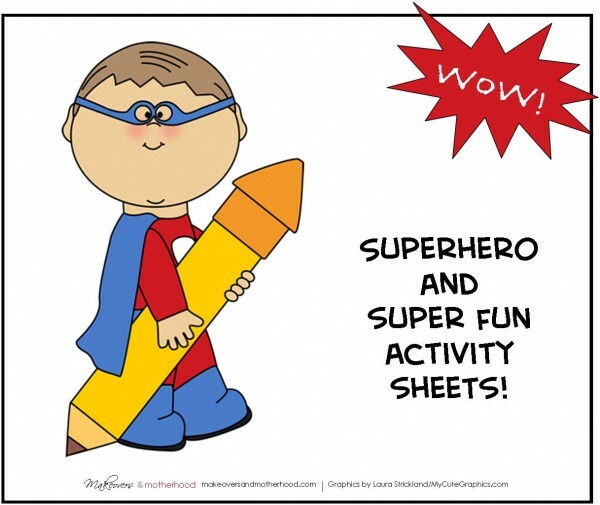 The six activity sheets include: a simple maze, counting activity, coloring sheet, a find the difference sheet, drawing activity, and a secret superhero message! Use it for car trips, quiet time activities, or to entertain your kids at a restaurant, doctor’s appointment, or church! No matter where they are, your kiddos will love these super activities! And… you can personalize the cover sheet for your little one for an extra special touch! Click on the graphic below to get your printable copy! NOTE: Chrome’s built-in PDF viewer may not print page in it’s entirety (even though the printable looks fine on the screen). If you experience this problem, try using a different PDF program (Adobe Reader or Foxit Reader) to print pages. I hope your little one does “super” with these sheets! looks like so much fun! thank you for sharing at Kids Learning Printables! How do you print the super hero package? Click on the worksheet preview. It will then open the .pdf (in a new window) for you to print from. Thanks for checking out our activity pack! While you're here, make sure to check out the scissor cutting practice sheets too! These are too cool! Thank you for stopping by the Thoughtful Spot Weekly Blog Hop this week. We hope to see you drop by our neck of the woods next week! Thanks for sharing your printable at the After School Link Party! My youngest son loves superheroes too. Thanks, Danya! Superheroes + activity packs = happy little boys in our house! Wonderful printables, thanks for sharing on Mummy Mondays!